Fundamental analysis and technical analysis. Under Fundamental analysis, you gather concrete information about a company's business to gauge the real value of the stock. On the other hand, technical analysis encompasses looking at the way pure market factors will affect a stock's movement. Picking a stock to invest in should invariably involve serious background research about the company, besides other factors. As an investor, even if you do not possess a traditional economics background, you should still dig deep into the fundamental analysis of a company, i.e., study the financial health of a company in order to determine whether it is a worthy investment option. 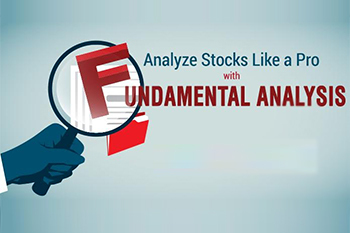 Stock analysis primarily involves two main schools: Fundamental analysis and technical analysis. Under Fundamental analysis, you gather concrete information about a company's business to gauge the real value of the stock. On the other hand, technical analysis encompasses looking at the way pure market factors will affect a stock's movement. For obvious reasons, Fundamental analysis is central to your ability to make money in the stock market. This is because this analysis makes you investigate the company's fundamentals and its corporate health. There are some business basics you need to keep in mind before you start analyzing public companies. As an investor, you need to understand that a company’s financial statements are perhaps one of the most telling signs of how the company is performing. You need to study the three principal financial statements: income statement, balance sheet and statement of cash flows. The income statement subtracts expenses from revenue to calculate the company's income or profit. The balance sheet compares a company's assets against its liabilities and stockholders' equity, while the statement of cash flows elaborates money taken in and doled out for functions such as operating, financing, or investing. Understanding financial statements are integral to fundamental analysis since they provide you with the numbers that will be used in your analysis. However, fundamental analysis doesn’t stop merely at addition of numbers. It requires collecting qualitative information as well. You should look for subtle information such as management communication and company’s expectations. You should try to gauge how efficiently the company moves towards its goals. In overall terms, a company’s performance can be assessed in terms of its earnings. But if you want to check the performance of certain assets, then you should look at a metric like return on assets (ROA). A number of numbers and ratios can be employed to estimate a company's performance. Metrics such as price-to-earnings ratio, earnings per share and gross margin are all useful in determining a company's relative health. When comparing the performance of two companies, you should ensure that you compare similar type of companies. For instance, analyzing a technology company like Google, with a P/E on any given day results four times as high as that of US steel, is unlikely to be a fruitful exercise. This is because while a lower P/E is generally more favorable as it suggests that a company with a given stock price takes in greater profits, US Steel is in the basic materials sector, which as a group doesn't trade with a P/E comparable to the tech sector. Hence, for your fundamental analysis, it is crucial that you compare similar kind of entities. Ideally, fundamental analysts work hard to find companies whose intrinsic value are greater or will be greater than its market value. This market approach is commonly referred to as "value stock" investing. And the key to using fundamental analysis like a professional is Benchmarking. Benchmarking is the process of observing standards against which you can measure the stock you are analyzing. However, there are no strict rules for fundamental analysis, which is why even the professionals get things wrong every once in a while. And one of the best ways to strengthen your fundamental analysis skills is through practice. As an investor, you should always challenge yourself. Benchmark stocks, develop opinions about them, and analyze the results. What should you do to improve your skills? 1. Pick 2 stocks and monitor them for 3 months. Pick one stock you like instinctively and one you don't. Study their fundamentals and make an objective assessment about each stock based on those fundamentals alone. Keep a record of how each stock progress over a period of 3 months. 2. Create a fundamental checklist. Make a list of the ratios, numbers, and other information you use to evaluate a stock. This is your checklist against which you will assess a stock. This list will help in breaking down the worthiness of a stock and will aid you on a regular basis. 3. Build your benchmarks. In course of time, you should be able to come with your own benchmarks. Every time you analyze a stock, you should refer how it compares with the benchmark. As you build a larger library of benchmarks, you will find greater success with fundamentals. Thus, as mentioned earlier, it is advisable to stop investing blindfolded and start investing using fundamental and technical analysis tools to avoid falling into risk traps. Also, one should first analyze their risk appetite, set clear goals and then take steps towards investing.